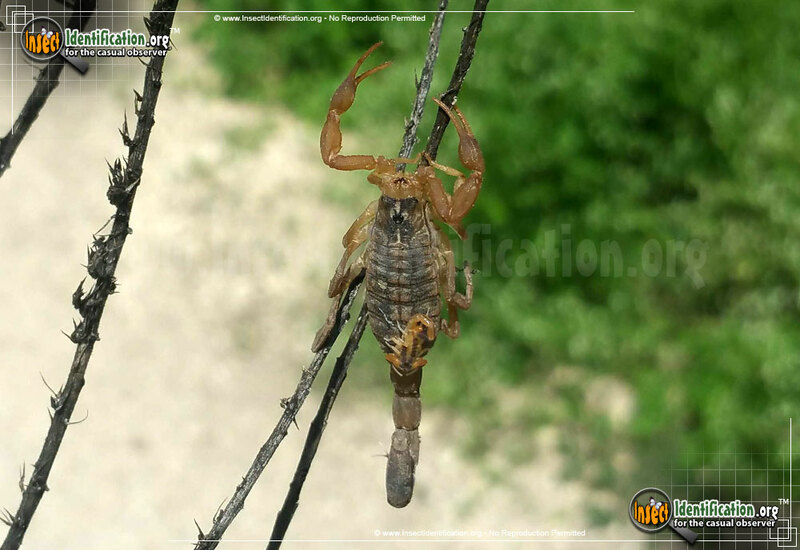 Detailing the physical features, habits, territorial reach and other identifying qualities of the Striped Bark Scorpion. Striped Bark Scorpions have a non-lethal, but still painful sting that heals on its own, which is good news since their indoor exploits increase the likelihood of encountering one. Striped Bark Scorpions have long slender bodies and a two-toned coloring. The pincers, legs and tail are a pale yellow-ivory while the abdomen is a dark brown. Two long stripes line the sides of the back. The pointy tip of the tail's stinger is black. Pincers are used to capture insect prey and hold it while the flexible tail tipped with its venom-filled stinger stabs it to death. This species is known to also sting people when surprised by them. This usually happens by unwittingly uncovering a hiding spot. The venom is mildly toxic meaning it is not known to kill people despite unproven claims. The sting in painful, however, and the wound swells and turns red. Pain subsides relatively quickly, but symptoms like numbness and irritation may linger for a while. A hospital visit is not necessary for adults, however those with severe medical and allergic sensitivities as well as small children that are stung by this scorpion should see a physician to manage pain and possible reactions. Striped Bark Scorpions are wandering hunters and can be found anywhere outdoors. They climb trees, fence posts, and wood piles. They crawl under rocks, tent flaps, and fallen trees. They crawl into empty shoes, sleeping bags, and homes. They can be seen crawling on floors, walls, and in corners. Habitats ranging from woodlands to deserts are home for the Striped Bark Scorpion. Water sources like sinks and tubs inside a human home are also attractive. At night, a phosphorescent light can illuminate their bodies, making them visible with a pale glow.